The three featured artists each approach the theme from unique standpoints. 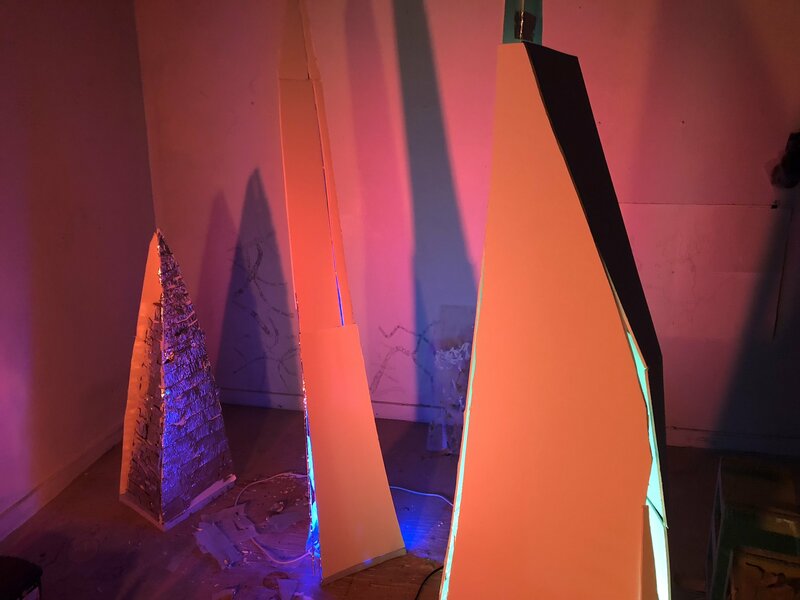 Juror’s choice winner Isabel Beavers explores space in the extraterrestrial sense, with her work centered on the Martian landscape. Honorable mention Samantha Morris expresses her views on space more traditionally, with oil paintings that play with shadows and value dynamics. 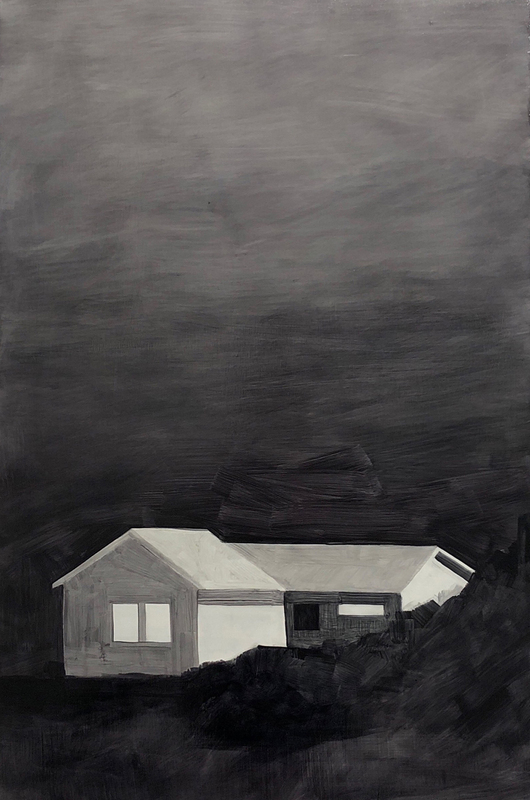 Finally, other honorable mention Lani Asuncion examines space from a perspective a bit closer to home, by contemplating the contrast between commercial development and nature — something that as inhabitants of Boston, we watch play out on a near-daily basis. 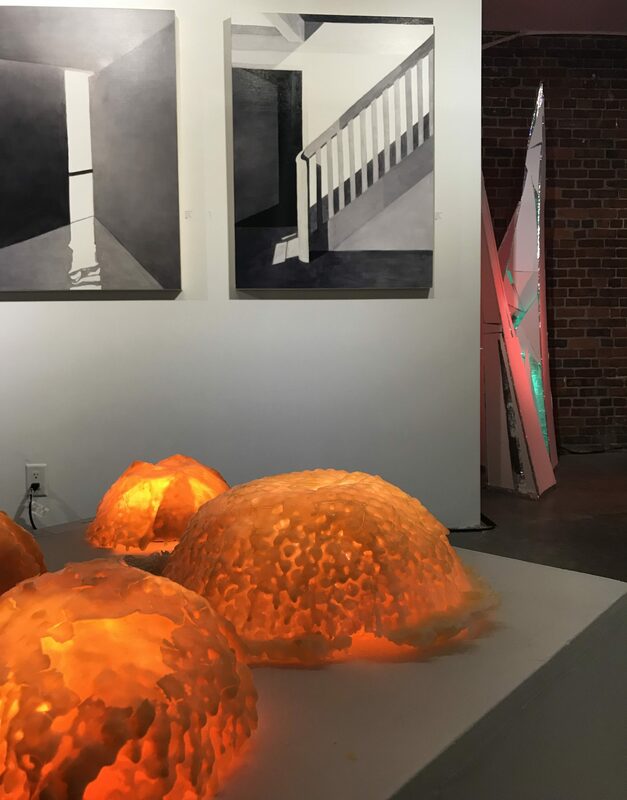 Isabel Beavers’s work demands attention, not only because of its proximity to the entrance, but because it is the one piece that includes a soundtrack. The eerie loop of a distorted telephone conversation plays loud in an otherwise quiet gallery. You’re almost compelled to seek out what’s driving this noise. A closer look reveals the source of the sound – a pointed, angular structure rising up from the ground. The piece, Mars is a representation of a Martian colony, and despite visiting the gallery on a relatively sunny afternoon, there is a certain darkness that looms. Samantha Morris’s work is a bit more straightforward, though only in the sense that she works with a more traditional medium. Her works play with shadows and the balance between negative space and solid objects. In her piece Light from Within, we see a house tucked behind what could be bushes or the natural fold in the landscape. The painting seems to be set at night, but by working in monochrome Morris keeps the scene ambiguous, leaving it up for the viewer to decide what they make of it. The brush strokes at the top of the painting are loose, but in one area above the house they become more chaotic, adding a tension to the piece. It’s almost as though something horrific is about to happen in this house, but not yet. In Light from Within, Morris makes the one question not just the space we can see, but the space that exists in time, before or after a moment. 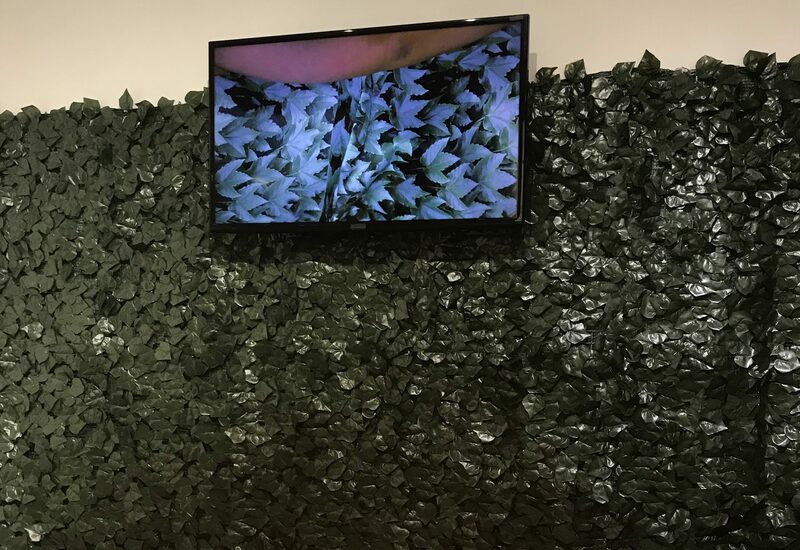 Using a similar multimedia approach to Beavers, Lani Asuncion’s project Growing plays on a television monitor mounted on a faux-ivy layered wall. The synthetic pseudo-flora is reminiscent of the kind of thing you might see in a building development or an office park, the kind of stuff they use to hide the rubble behind the fence, the kind of plant that never needs to be watered or looked after. The looping video reflects that same leaf pattern, rustling to reveal a hint of skin. As the foliage shifts, we see that it is in fact a person wearing a dress with an ivy print. Lani’s shift in focus addresses the notions of expectations and assumptions, tying back into the larger topics within her work of nature as a product rather than the environment. The video goes on to show the silhouette of a figure, moving toward the camera with what appears to be a soft, glowing orb of light in their hands. As the figure draws near, we see that this “will-o’-the-wisp” is no supernatural spirit at all, but the reflection of a back-lit screen, as seen in so many smartphones or tablets. Once again our assumptions are challenged, and we’re forced to reconcile the fundamental beauty of the luminescence with its manufactured source. Despite each artist coming at the subject from a different place, they all seemingly come to the same idea, further than simply addressing our relationship to reality. There is a connection to humanity in each piece displayed, whether it be our future on this planet (or another), the moments big and small that we share with those in the spaces around us, or how we all live together in the changing landscape of our city. And while each artists poses provocative questions, ultimately the answers are up to us. The exhibition runs through November 25th at the Annex at the Fountain Street Gallery (460C Harrison Avenue, Suite 2 – right near SOWA). You can also find more information at their website.